It’s been crazy around here since my last run which was last Friday. I guess this is a good week to take a recovery week since I still haven’t run and know that I won’t be able to run Saturday either. I have finished the first phase of my sub 3 marathon plan though. 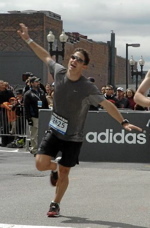 I spent March and April focusing on weight loss and running form. Since I’m not getting any younger, I’ll be 47 this month, I decided there are only 2 ways to become more efficient...lose weight and improve running mechanics. I started at 170 lbs 2 months ago and have gotten down to 150 lbs. I used Chi Running as my guide to improve my form. I wasn’t way off from where Chi Running says I should be, but I have tweaked my form a bit and it is feeling more natural now. Now to begin a phase 2...slowly increasing mileage. I plan to build a large mileage base through August, then I will spend September and October working on speed. 10 on trails than core. 10 miles on the TM at 7:30 pace. Felt really easy the whole time. HR maxed out at 144 at the end of the last mile. Then core. My legs were a little tired this morning after my faster than usual 10 miler yesterday and then playing soccoer last night, so I just took it nice and easy on the trails this today. I did 10 miles and then some core. Each morning as I awake I kneel in prayer and speak with my Heavenly Father and tell Him about my life and my upcomming day and my worries and concerns and thank Him for all He has blessed me with and usually ask to be protected throughout the day. My prayer was answered this morning in a very real way. I was out on the trails on my 7th of my 10 mile run just coasting along at a nice easy pace. I was on a little section of narrow single track trail that I often cover a few times per week for the last few years and I saw a mountain bike rider coming toward me. I thought to myself, that's weird, I don't think I've ever seen a biker or really anyone ever on this little section of trail before. As he approached I got off the trail for about 5 feet so he could pass and then got right back on. In the few seconds I was off the trail while we were passing each other, I heard him yell and I turned around and he was veering off the trail with his feet up. I stopped to look back and there was a rattle snake in a little divit right in the middle of the trail all coiled up but perfectlly camoflauged and very hard to see. In a 10 mile run, what are the odds that I go off the trail for 5 feet because a biker is coming in an area I've never seen a biker and it is those few feet where a rattle snake was coiled up ...and that darn snake never rattled, not even when we both went back and looked at it. It finally just slithered away. As I ran away I said a prayer right then and there thanking my Heavenly Father for His love and protection. I believe I was divinely protected this morning and I am greatly humbled to know that God knows me and loves me as he does everyone. After yesterday’s run I couldn’t bring myself to get back out on the desert trails so I kept to the roads...10 easy then core. 12 with Blake on a warm windy morning...then core. First 60 mile week of the year! 10 easy on the roads. Then core. 10 easy on the TM at 7:30 pace with max HR of 137... then core. 13 miler, first 8 uphill last 5 steeper downhill...then core. My upcoming marathon is downhill so I figure I better bee doing some downhill running about once a week. 10 with Blake this morning then core. then 8 miles on TM at 7:30 pace between early morning meeting and seeing patients. 10 nice and slow then core. Tried out some new Kinivara 9s. They were a little lighter than the 8s and still had a nice toe box and good responsiveness to them. 10 nice and easy then core. That was a nice recovery week. Now I need to string together a few 60+ mile weeks in a row. 10 with my brother in law. He wasn’t used to the heat making the last few miles tough for him. 10 comfortably easy then core. When I got up at 5 it was already 83 degrees, first morning over 80 of the year. Summer is officially here. 13 miles climbing 1000 ft the first 8 miles then descending 1000 ft the last 5. 10 a little faster than I should be running an easy aerobic run.